Ceramic braces are the ultimate treatment for anyone who feels self-conscious about the appearance of braces. These discreet braces straightens the teeth without affecting the way you look during the treatment process, which means you can smile confidently both during and after treatment! Ceramic appliances fit on to the front surface of the teeth and are considerably more aesthetic than stainless steel fixed appliances. They are not invisible appliances. Wire with a plastic coating can be used to blend in even further. 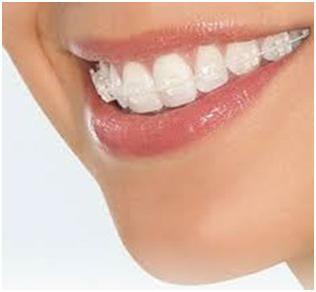 The biggest appeal of ceramic braces is their barely visible appearance. They are far more discreet than traditional metal braces but they still achieve the same brilliant results. The brackets used in ceramic braces won’t discolour, so you don't need to worry about them being obvious during treatment. Ceramic braces are also comfortable as they use low forces to move your teeth into the correct position. This increases the comfort and safety levels of the braces. After a short period of adjustment you’ll be able to eat and speak without discomfort. Is it easy to brush your teeth with ceramic braces? It's important to spend extra time brushing your teeth when you’re wearing ceramic braces and we recommend brushing after every meal. We will give you helpful advice about how to clean your teeth when you’re wearing ceramic braces. If you’re looking for a discreet way to achieve the smile you’ve always dreamed of, call us now to arrange a consultation and discuss ceramic braces in detail with our expert orthodontist.